Learning the proper method of putting on swim caps ensures the right fit. It may seem like a simple process to put on custom swim team caps, but there is a specific process you must follow to ensure the proper fit. This is especially true forwomen’s swim caps because women often have a lot of hair to tuck in. Learning the proper way to put on swim caps will ensure the right fit to ensure your best performance in the water. Place both hands inside your swim cap and loosely lace your fingers together. The long axis of the cap should be vertical to the ground. Hold the cap in front of you with the opening toward you. Push your hands out against the sides to gently stretch the cap. Instead of raising your hands to put custom swim team caps on your head, it is best to bend your head forward, bringing your head to the cap. Start by placing your forehead to the front of the cap and gradually stretch the rest of the cap over your head to the back. If you have longer hair, you need to stop about halfway back. At this point, twist your hair and create a bundle of hair on the back of your head. Never create a ponytail or a bun. Your hair should be loose. Hold it with one hand, while you proceed to stretch the women’s swim cap over the rest of your head. Make sure the cap covers all of your hair. You may need to rearrange your bundle for the right fit. Applying swim caps to wet hair often works better than dry hair. You can even sprinkle a small amount of corn starch inside women’s swim caps to make the process easier. If your particular cap isn’t fitting well, you may need to consider a different style or material for the proper fit. Wearing custom swim team caps isn’t always as easy as it looks. However, it is an important element to become a successful swimmer. Learning how to properly wear swim caps will ensure you are able to perform at your best every time. If you are looking for women’s swim caps for your next meet, contact us. 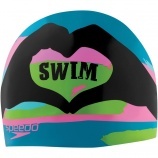 We offer all the swim caps you need to find the right fit. Fun swim caps allow you to have a little fun in the pool. There is plenty of time to keep swimming focused and serious. However, it never hurts to have a little fun in the pool as well. Whether you wear these fun swim caps during your training to keep things light or you wear them when you are swimming for fun, you will become the focus of everyone who is at the pool. Sometimes it can be fun to draw the attention for something other than your skills. You want all eyes to be on you when you are in the pool. However, with the Pink Eyes Silicone Swim Cap, you will have your new “eyes” on everyone else. As you swim through the water, the eyes on the top of this cap will make everyone feel as though something else is watching them, whether they are on the sidelines or in the pool with you. The bright color is another attention grabber. If you like the idea of having eyes on the top of your head but don’t want to wear pink, try the Green Monster Silicone Swim Cap. With its bright green color and the friendly monster face imprinted on the cap, you are sure to draw attention wherever you go, both in and out of the pool. The smiling face of the monster means you won’t scare anyone in the pool. Instead, you are more apt to draw a smile or a laugh. Perhaps you don’t like the idea of having an extra set of eyes or a green monster on your swim cap. You can still have a lot of fun with your cap by choosing the Monkey Silicone Swim Cap. This unique swim cap features a cute monkey imprinted on it, allowing you to enjoy a fun look when you don’t need to be so serious in the water. 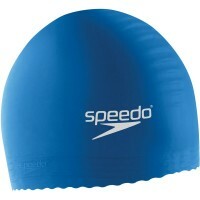 All of our silicone swim caps provide you with a comfortable fit with less hair pulling. When you put on one of these fun swim caps, you can forget that you are a competitive swimmer for a while. Whether you wear it while you are training in the pool or just for fun, you will find everyone has their eyes on you. Swimming is supposed to be fun. Make sure you are having fun by choosing one of the fun options you have available.